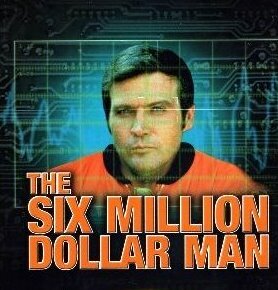 In the 1970's television show, The Six Million Dollar Man, astronaut Steve Austin is severely injured in a plane crash. Steve Austin, "a man barely alive" is rebuilt as a cyborg. He is rebuilt, "better, faster and stronger." The week after attending the National Catholic Youth Conference I have decided that I, as a catechist, need to be rebuilt and be at least better. I'm not sure being faster or stronger will assist me in teaching the gospel. I have helped my parishes senior high youth program for nearly ten years by either helping with senior high youth group or teaching confirmation. My frustration has been trying to figure out how to properly teach while at the same time keeping the teen's attention. The last thing a high school kid wants on a Sunday afternoon is to hear some lecture, especially from me. Let's face it, I'm not a great speaker. On the other hand, the projects that seem to be out there that the teens enjoy do not easily get the point of the lesson across. In my humble opinion, they come across too much as arts and crafts and not as a catechitical tool. I really do not feel that the "Crayon Jesus" stuff properly teaches. I also do not feel that listening to me speak on a Sunday afternoon teaches either. I have not done any studies but I believe that glassy, blank, stares are the look of people who are not receiving the message you are trying to get across. But at least they have their eyes open! Friday afternoon I attended Mark Hart's workshop on the Bible and just had a really good time. He was funny and entertaining and I learned some interesting things. The next day, someone pointed out to me that I should take that as a challenge. Speaking about Jesus should not be boring. I thought about it and realized--there are no boring speakers at NCYC. From Mark Hart to Bob Rice to Fr. Tony--they all reach and speak to the teen where the teen is. When I presented this idea to someone they said, "Sure, if you have the gift." That's a valid point. I also realize that the guys who give these high energy talks give them repeatedly and can spend time to iron out the rough spots. Your average cathecist only gives a lecture once a year. My Marine drill instructor taught me that "Excuses are like [belly buttons]. Everyone has one and they all stink!" He used something more graphic than belly buttons though. The point is that we should not use excuses. If my time is valuable enough to give up to teach confirmation. If I am really serious about wanting to teach the gospel then I need to do better. I need to do a better job preparing. I need to make the lesson my own and do whatever I have to do to reach the teen. Mark Hart may not have directly told me, "Jamie, you need to do better." But he sure as heck raised the bar and showed me what is possible.